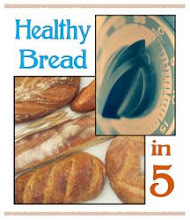 Like many AB in 5/HB in 5 converts I constantly proselytize (some might say bore), encouraging anyone who will listen, and some who would just as soon not listen, to try this great method of baking bread. Although my efforts have met with some success, the one area I have failed utterly is with my three beautiful daughters, who have been more than happy to eat the fruits of my labors without having to labor themselves—UNTIL NOW! My youngest, smartest, most beautiful, and now absolute favorite daughter Becca has become an AB in 5 baker. Here is her first effort, a Rosemary Focaccia made from the AB in 5 Master Recipe. Becca and her housemate Marissa are continuing to bake their way through their first batch of dough, and and plan to try the HB in 5 Master Recipe next.